Solution Articles are best for when you want to gain a detailed understanding of how a feature works. Often these contain templates, screenshots, and links to additional articles, all of which are organized by topic. You'll also find a number of these solution articles linked at the bottom of each lesson in the R365 Academy. 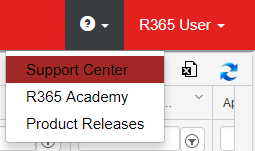 Logged in Users can access the R365 Community Forums as well as manage their support tickets. 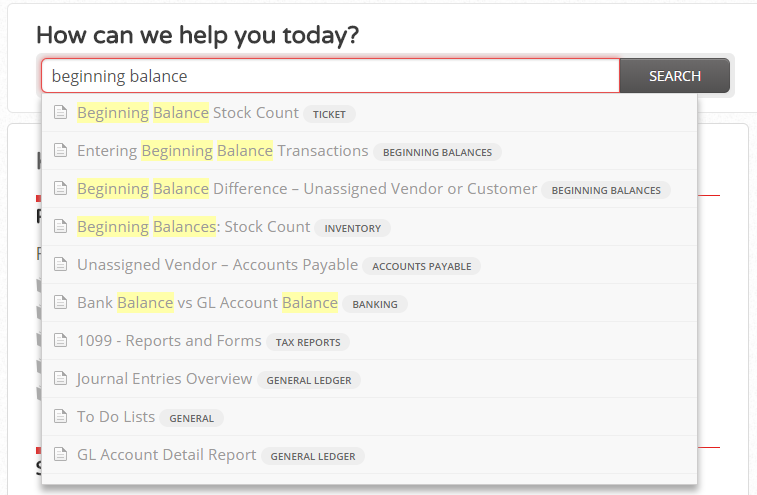 If you are set up as a power-user, you'll also be able to view all the tickets created from within your organization. There is a Forum for every type of User. Browse the Forums and find where you can contribute. Our goal is to allow Users like you to share your ideas, best practices, and solutions with your peers, other R365 Users. Each post will be approved by a moderator so that we can ensure quality content and help direct users to support when needed. If you want to receive instant email notifications when a forum has new activity, like an upcoming User Group, open the forum and click the 'Follow' button. The 'Follow' feature is especially useful in the event that there is a critical system-wide issue, so you can be notified as soon as it's resolved. When you are done following a Forum, repeat the process by clicking the 'Following' button to change it back to 'Follow'. To the right of the Forums, you can view a list of 'Popular Topics' that have been recently active. Additionally, 'My Topics' will include all the Forums that you have contributed to. We'll be on the lookout to reward our top contributors, so please don't be shy. To better meet your needs, our Support Reps are specialized for each area of functionality within R365. Support is typically staffed between 6 AM and 5 PM PST on weekdays, as well as limited weekend and holiday hours. Chat and Phone support are available during business hours, while tickets can be created at any time. When you reach out to support, either through chat, phone, or a ticket, a Tier 1 Representative will help gather details and determine which team can best resolve your issue. Chat: is best for quick and easy questions that don't require a specialized team. Chat Reps can also help you create a ticket, or set up a call back from a specialist. Phone: is best if you have an after-hours emergency. Please leave us a voice message, and a tech will review your message and escalate as needed. Ticket: Creating a ticket is the most effective way to resolve all other issues. These will help our team to troubleshoot your issue and pull in other specialists if needed. 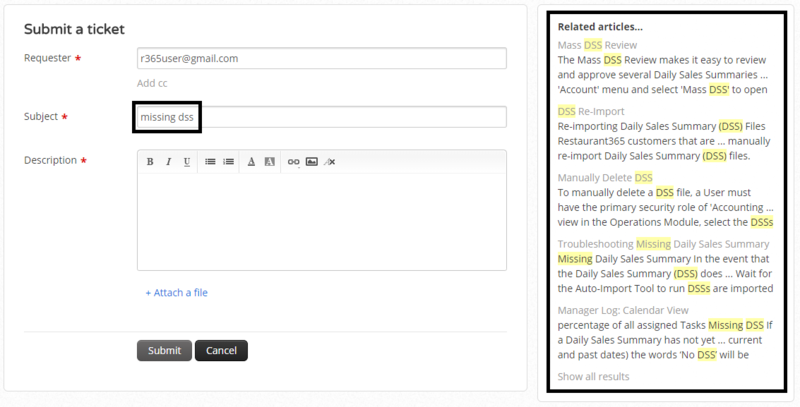 When you create a ticket from within the Support Center, related articles will automatically appear after entering the ticket subject. Please take a moment to review these articles as they may provide you with an instant solution. You can review the status of your tickets by opening the 'Tickets' tab or clicking 'Check ticket status'. This list will contain every ticket you've ever created. The list can be filtered by status and sorted to show you the most recent activity. Make sure to check for tickets with the status of 'Awaiting your reply' as these tickets require a response from you before they can be resolved. Tickets can also be tracked via email. You'll receive an email notification each time there is an update to any of your tickets. You can respond directly to that email, or reply from within the Support Center, it's up to you! We are committed to making your support experience as easy and painless as possible. Please take a moment to login and browse the great content we have put immense effort into creating. While you're there, we invite you to become involved in the Community Forums and share your knowledge with us as well! We look forward to being of service!